CHATELAIN -Mappe-Monde pour connoitre les progres & les conquestes..
CHATELAIN, H. - Mappe-Monde pour connoitre les progres & les conquestes..
Mappe-Monde pour connoitre les progres & les conquestes.. - CHATELAIN, H.
Map maker : CHATELAIN, H.. Size : 13.2 x 18.1 inches. / 33.5 x 46.0 cm. Description :Unusual double hemisphere map with California as an Island. Dutch text describes the expeditions and colonial possessions of the Dutch East India Company. 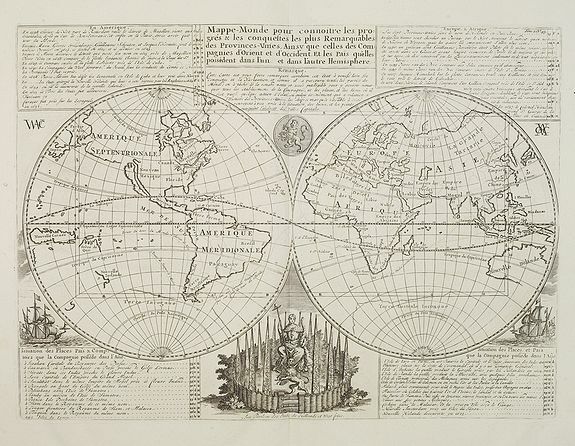 The map originated in about 1670 and the plate was acquired by Chatelain who added the decorative elements, which include sailing ships, the Dutch crest, and a figure representing Europa seated inside a native fort.